A bouquet of 25 roses means "congratulations". You are very good! 25 roses - You are pregnant? You have promoted new? because 25 roses mean "congratulations". 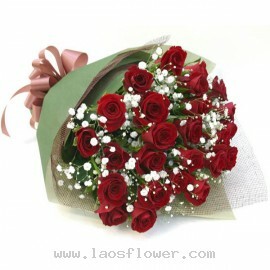 Sending a message of congratulations by sending 25 roses. 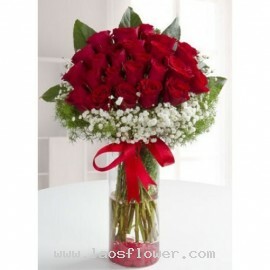 25 red roses arranged in a tall glass vase accents with lot of purple caspia flowers and green leaves. Adorned with a red bow tie. The color of flowers and ribbon can be changed as you like. Occasionally, substitutions may be necessary to create your bouquet due to the availability of certain flo..
A bouquet of 25 red roses, large roses specially selected accent with white gypsophila. Wrapped in mesh and green paper on the outside and tied with brown ribbon. The color of flowers and wrapping materials can be changed. Please request when ordering or email us. Occasionally, substitutions may ..
A vase of 25 red roses arranged in a vase accents with white gypsophila flowers and green leaves around the bouquet and tied with red ribbon. The color of roses and ribbons can be changed by request with an order or request by email. Occasionally, substitutions may be necessary to create your bou..